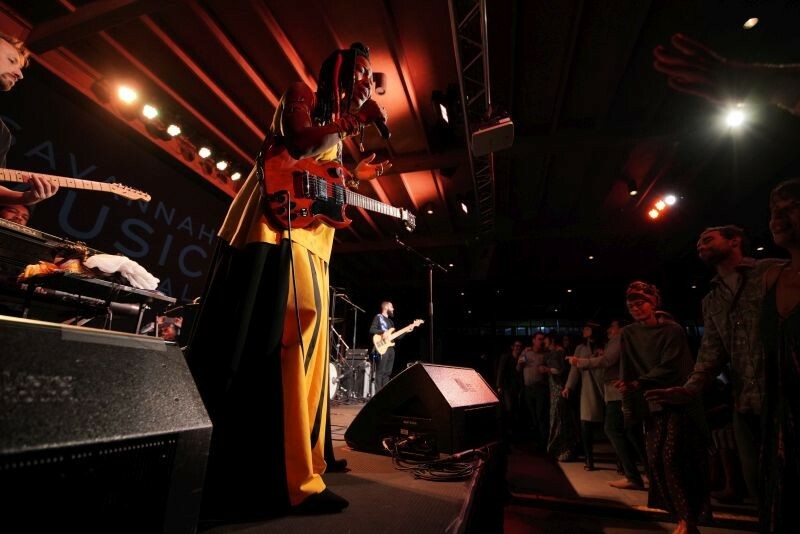 One of the great services the Savannah Music Festival provides every year is bringing in a variety of world music to town — particularly African music — that Savannah wouldn’t ordinarily get a chance to experience. I was particularly thrilled to learn that this year they had booked Noura Mint Seymali, an artist I’d followed via Spotify but assumed I’d never get a chance to see and hear live. 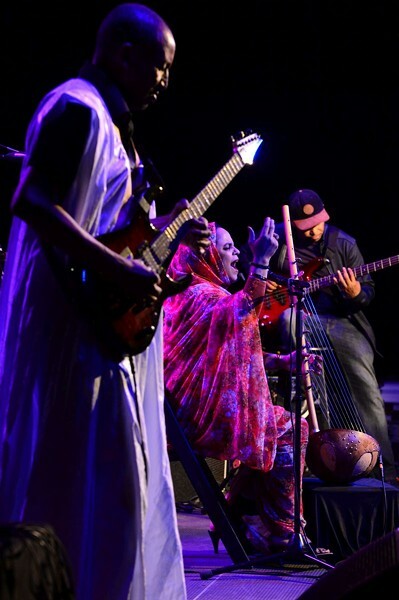 This griot, singer, and instrumentalist from the northwest African nation of Mauritania combines a forceful, strong, and deep voice with the sensitivity that comes from representing one of the world’s oldest musical traditions, a sublime blend of African and Moorish sounds. Her band, led by husband and guitarist Jeich Ould Chighaly, took the stage at the Ships of the Sea North Garden to warm up the crowd before Seymali’s entrance. I could easily enjoy a concert of nothing but Chighaly’s effortless, effervescent electric guitar, evoking the style of indigenous instruments such as the tidinit and the kora with the electrified feel of modern Afropop. After a few minutes, Seymali herself took the stage to great applause. She began the set seated, playing the traditional woman’s instrument, a harp called the ardin. The set’s first songs focused more on the feel of the band as a unit. As the set progressed, however, Seymali put down the ardin, stood up, and took the stage to full effect. Her voice is a force of nature — full, deep, evocative — and the crowd responded to this sound and singing style which is so traditional in north Africa, but not traditional at all in Savannah, Ga.
After a brief intermission, the Malian star Fatoumata Diawara took the stage with her band of young musicians, who lent her traditional stylings a modern feel. As a key trade corridor between three continents for millennia, Mali is one of the great centers of music on the planet. The north African nation represents a brilliantly balanced, organic cultural crossroads of sub-Saharan African music traditions, Arabic/Islamic genres, and European influences. All of these were fully recognizable and present in Diawara’s high-energy set, punctuated by frequent stage patter involving themes of cooperation, diversity, and the breaking down of all artifical barriers between people.